Welcome to Revolutionary Outdoor Products. This is the home of the ORIGINAL i-KAM XTREME video camera sunglasses - eyewear with an advanced mobile video recorder. 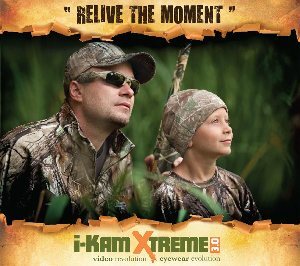 The new Ikam Xtreme is the latest hands free video recorder. It makes the helmet camera obsolete! There are no wires or battery packs, just a lightweight pair of sunglasses that is capable of recording 3 hours of unsurpassed quality video & audio footage. The footage can then be easily downloaded onto your computer. Don't be fooled by cheap look-alikes that have low quality video resolution and fuzzy audio.